Give Armored Sealcoating a call for driveway asphalt maintenance in Pleasant Prairie, Wisconsin; you’ll be glad you did! Our contractors provide superior sealcoating services, are reliable, and always respectful of our clients’ property. We’re happy to seal coat residential and commercial driveways. More so, we’re a great choice for your winter services too. Don’t hesitate to contact us for a free estimate. Our sealcoating services help prevent and delay pavement corrosion; which means your asphalt will look better and last longer. A poor sealcoating job only last 1 – 2 years. When Armored is on the job, you’ll go 3-5 years before resealing is necessary. Of course, harsh weather and high traffic volumes will have a larger impact on your asphalt; shortening the time in between seal coatings. Cracks are not only unsightly, but they can also be the start to serious asphalt problems. That’s why crack filling is an essential part to every asphalt maintenance plan. Cracks left untreated will spread and deepen; increasing the chances that water will breach the base of your pavement and speed up deterioration. We’re happy to stop by and repair cracks even if it’s not quite time for seal coating. When you’re choosing a parking lot striping company in the Kenosha area, make Armored Sealcoating your first call! Our professionals have the experience and equipment to maximize the available space and efficiently control vehicle and foot traffic. 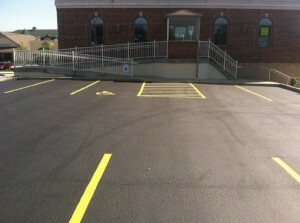 Parking lot striping is included in every commercial maintenance package. When we’re not seal coating driveways because the weather is too cold, our professionals provide winter services to make snowy days easier for our clients. 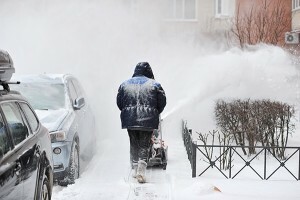 Our snow removal services include clearing snow from driveways, parking lots, and walkways. So if you’re located in Kenosha, get a quote on our plowing packages. Need firewood in Pleasant Prairie, Wisconsin? Armored has a healthy stock of firewood for sale! Give us a call or contact us online to inquire about pricing and placing an order. Choose from hardwood, oak, or a mix of both – our firewood is perfect for residential and commercial use. If you have a home or business in Pleasant Prairie and need sealcoating services, give us a call at 262-515-4150 or contact us online!